Industry observers had been snickering about a promise made by Apple's chief executive Tim Cook to "double down" on security, but a series of jaw-dropping surprises have proven that, outside of a steady stream of immaterial leaks, the company remains an opaque mystery to its competitors, to pundits and even to analysts tasked with understanding the inscrutable innovation factory. From the 64-bit A7 that still remains shrouded in secrets to the company's strategy for maintaining its industry leading profitability in an increasingly competitive smartphone landscape, nobody tasked with knowing Apple seems able to guess its next steps. 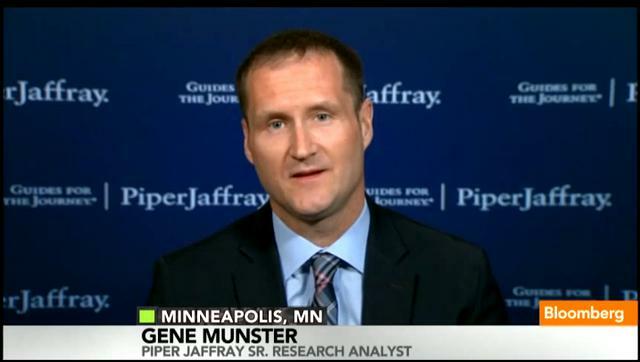 That includes Piper Jaffray analyst Gene Munster, who has maintained a bullish outlook on the firm since before it was even fashionable. But rather than just admitting that Apple is a tough nut to crack, Munster had started copying other analysts in simply insisting that up is down and that Apple is wrong about its own business in a field where it has been trouncing established veterans and proving experts wrong for years. 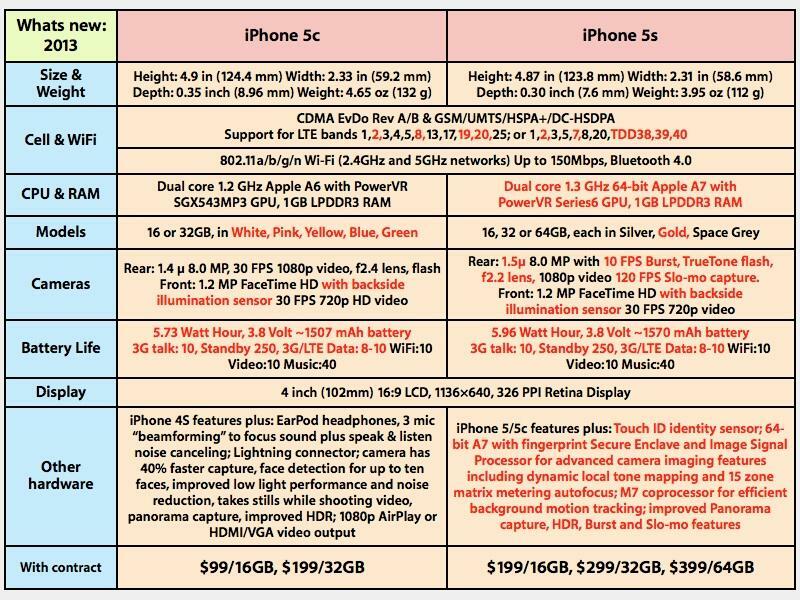 In August, just a month before Apple launched its new iPhones, Munster described the iPhone 5c (which had already made several appearances in a series of spy photos) as having "lower end internal specs (processor, camera, memory, etc.) 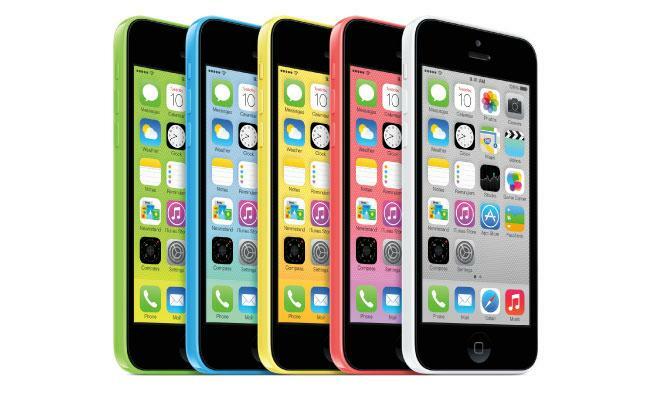 than the 5S/5 line up," estimating that the device would be priced at $300 without a contract. He also wrote his clients saying, "we believe that Apple may exclude some software features, such as Siri, which we note was not an option on the iPhone 3GS or iPhone 4 upon launch." He also expected Apple to discontinue the iPhone 4S, leaving it to sell an iPhone 5c, 5 and 5s. This was profoundly wrong in every respect. The only things Munster got right were already public knowledge: the 5c having a plastic case and the same 4 inch display. Munster not only got all of his predicted details wrong, but also demonstrated that he had no idea of what Apple's overall strategy for the 5c actually was. Munster appeared to be describing facts he knew, or perhaps educated guesses he made based on industry checks or historical trends. But even there he was wrong across the board. Apple never even hinted that it planned to make a cheap phone, nor has it released iPhones with stunted new hardware before, nor has it has ever launched a new iPhone model lacking the previous year's software features. The only iPhones that lacked support for Siri were those that appeared before Siri was released as a feature, and that was only because they lacked hardware that the new feature required to function adequately, including specialized noise reduction circuitry that debuted in the A5-powered iPhone 4S alongside Siri two years ago. Rather than dumbing down the iPhone 5's internals to deliver a more affordable alternative to the new top of the line iPhone 5s, Apple enhanced the iPhone 5 to produce a better 5c, adding a larger battery, new baseband components for broader LTE compatibility with new carriers and an improved front facing FaceTime camera sporting a backside illumination sensor for better low light selfies. When the new iPhone 5c was released by Apple as "a better 5" at a price tier identical to the previous year's "affordable" iPhone 4S ($99 on contract, or $549 unlocked), Munster followed other analysts (including Jefferies' Peter Misek) in critically attacking the company, even though it wasn't Apple that was wrong in every respect, it was Munster (Misek was wrong, too). When Apple beat its own guidance but "missed" the expectations of "the Street," it was punished severely by downgrades that helped establish the company's stock price far below the relative prices of industry peers bringing in less revenue, earning less and sitting on far less cash, forcing Apple to expressly state in January that analysts should stop blindly adding a thick layer of bonus expectations to its guidance going forward. Cook also added a second warning directed at analysts who were making vast leaps of logic based on supposed "checks" with Apple's suppliers. "The supply chain is very complex, and we obviously have multiple sources for things," Cook said during Apple's January quarterly earnings conference call. "Even if a particular data point were factual, it would be impossible to interpret that data point as to what it meant for our business." This didn't stop analysts from making wild claims about billions of dollars' worth of business based on scraps of data coaxed from its suppliers. Misek, for example, ignored Cook's comments and ran with the idea that Samsung's "wafer starts" from June were a clear sign that Apple was severely cutting back on iPhone chip production in the critical months leading up to its September new model launch. The market appeared more willing to listen to Misek than Cook, further driving down Apple's stock prices to ridiculous levels over the summer. Last September, Apple's overall performance had earned it a stock price above $700 as it ramped up to launch iPhone 5. Apple didn't estimate how many iPhones it planned to sell at launch, but over the previous two years Apple had announced iPhone 4 selling 1.7 million units over its launch weekend and that iPhone 4S sales had "topped" 4 million at its launch. 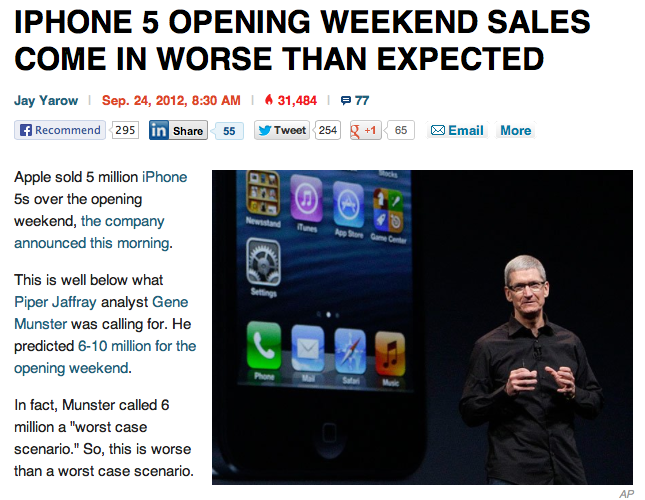 Munster predicted a massive leap in iPhone 5 sales to 6-10 million over the fall 2012 launch weekend, calling sales of 6 million a "worst case scenario." When Apple announced sales of 5 million phones over three days, Munster's figures were cited as contributing to the malaise of disappointment and general negativity that dogged Apple over most of the next year. Bizarrely, the next summer when Samsung announced its "confidence" that it would pass ten million channel shipments of Galaxy S4 units four weeks after it went on sale, the same journalists reported it as a strong start for the new model. Exuberance around Samsung lasted for months, until the company began scaling back its own estimates as its flagship phone proved to truly be a disappointment. Fast forward to this year's iPhone lauch: Munster, after observing iPhone 5c & 5s launch day lines and taking notes, reiterated his firm's prediction of weekend sales of 5 to 6 million, detailed as "2.5 million iPhone 5s" and "3 million units" of iPhone 5c. 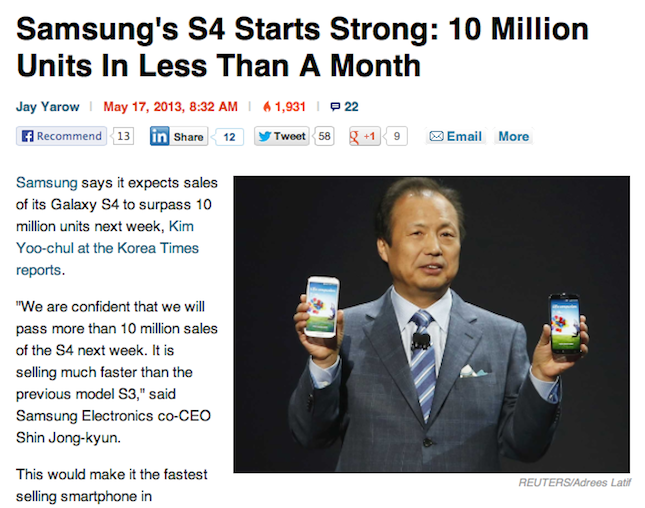 In parallel, KGI analyst Ming-Chi Kuo predicted sales of 6 to 8 million. When Apple announced sales of 9 million iPhones over the weekend, Munster told Bloomberg, "When I saw that 9-million number, I basically fell out of my chair." Rather than being impressed, however, Munster explained that "the real number was 5.5 million," that is, his prediction was right, despite being off by miles. He continues to insist that he wasn't wrong, and Apple was in some way, perhaps in reporting figures that meant something other than what the company's announced sales meant the previous year, or the year before that, or the year before that, or the year before that, or the year before that when it launched the original iPhone. Munster knew Apple was selling two new models this year, he knew what carriers and in what countries Apple was launching the new phones, and he had some indication that inventories were constrained and that demand was enthusiastic. His explanation that Apple did something new and different this year is absolutely incredible, given that there wasnt anything unknown about what Apple was doing when he reaffirmed his far too low prediction the day the new models went on sale. He simply guessed wrong by a huge factor, and yet after the fact blamed Apple for his error. That's far worse than simply acknowledging that his model was wrong and that Apple turned in surprising, unanticipated results. Munster's bizarre explanation of Apple's sales not really being what Apple said they were, but rather some Byzantine, inscrutable enigma that must be processed by the Munster Algorithm to extract the true Munster Predicted Number, was enough to impress Joe Wilcox, who is easily impressed by any figures that flatter any company other than Apple, or which appear to cast Apple in a bad light. When Strategy Analytics invented numbers suggesting that Microsoft's Surface tablet had sold 3 million units in the spring quarter, Wilcox uncritically bought it because he desperately wanted good news about the Surface. Three months earlier, Wilcox had insisted in print that "Surface RT sales are quite good, you just don't know about it," so with some analyst data supporting what he wanted to believe, Wilcox was ecstatic. "Now there are real numbers, and they're quite good," he wrote. It turned out Strategy Analytics was wrong and Microsoft's Surface wasn't really selling at all. Wilcox's relief in finding data that supported his desired version of reality for the Surface was forced to make an unscheduled pitstop in Backwards-land when he had to grapple with iPhone launch numbers that didn't support what he wanted to believe. Apple had actually sold three times as many iPhones in a weekend than Strategy Analytics had incorrectly claimed Microsoft had shipped in Surface tablets across three months. Munster's elaborate explanations of how Apple's record iPhone launch sales were actually nothing special because they weren't in line with his predictions is exactly what Wilcox wanted to hear, empowering his clever-by-half headline: "Apple's iPhone 5s failure, along with a stock photograph associating the biggest smartphone launch in history with the idea below average." Wilcox warned his readers that Apple was "carefully managing the launch for maximum marketing benefit, twisting truth as so many companies try to but few achieve as well as iPhone's maker." What was Apple twisting? According to Wilcox, the fact that Apple's discontinued iPhone 5 was no longer piled up in mountains of unsold inventory like the Surface RT meant that the company's reported launch sales were really just replenishing the channel, and therefore could be safely ignored as data from which to make any sort of conclusions. 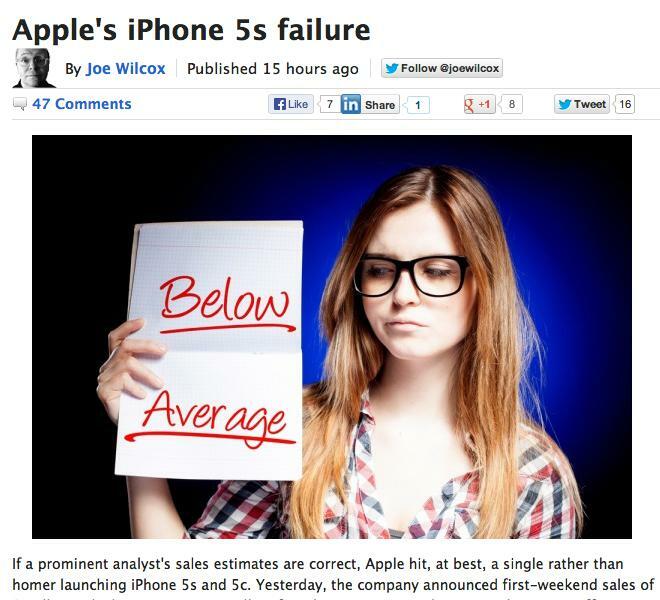 Wilcox was so upset about Apple's sales that he began churning out daily reports on the subject, one day pleading with readers to understand that "iPhone 5c sales of any kind mean lower margins at launch," and the next day explaining that new data indicating that the more expensive and profitable iPhone 5s had actually been outselling the 5c by a factor of more than 3x meant that Apple's inventory must be positively clogged with unsold 5c boxes. The data that confounded Wilcox' hope that Apple's sales would be dominated by the less profitable iPhone 5c (which is still more profitable than any Samsung phone, and by extension, any other smartphone) was research by Localytics that suggested that Apple's high end iPhone 5s was dominating its initial launch sales. The firm reported that not only was the iPhone 5s making up three fourths or more of Apple's sales, but that the tilt toward premium sales was most noticeable in the country that analysts had been flogging as desperately needing a cheap model: China. 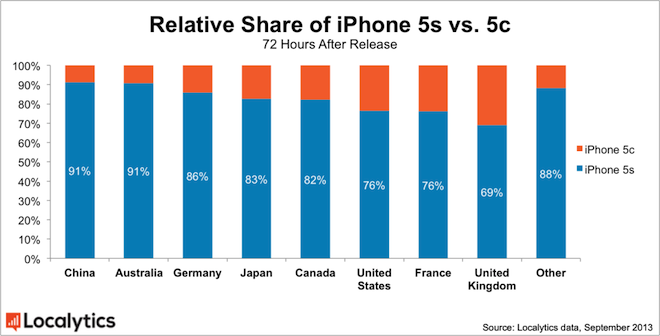 Localytics said that while the 5s made up 76 percent of sales in the U.S., it averaged 82 percent of launch weekend sales in other countries and made up a whopping 91 percent of sales in China. Apple's game plan going forward is anyone's guess, but with guesses like these, there should be some apologies in order.